Backyard Summertime Sky Over New Jersey. Solar Disk and Sunspots. One of the websites that I follow for sunspot and auroral (northern light) activity is SpaceWeather.com. I noticed yesterday and today that there are three new sets of active sunspots (1260, 1261, and 1263). My telescopes have solar filters to allow safe viewing of the solar disk. The following images were taken with a 3.5″ and 7″ Questar telescope and clearly show the sunspots. 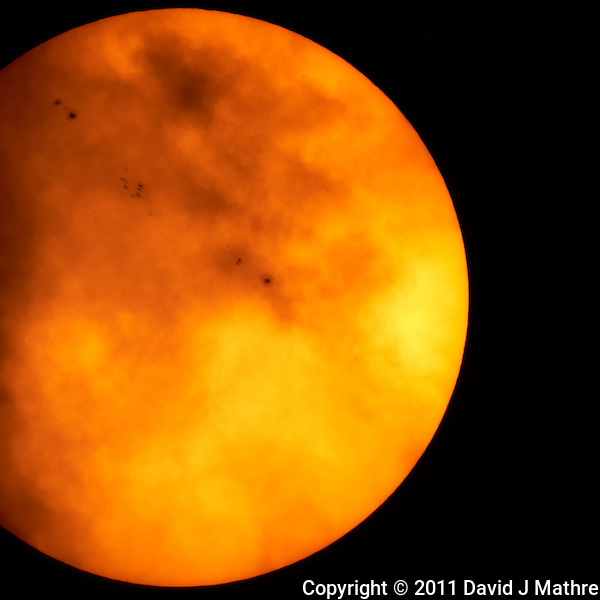 The third image has some clouds passing in front of the solar disk. The solar filter for the 3.5″ telescope is darker (lets through less light) than the filter for the 7″ telescope. This required increasing the ISO and decreasing the shutter speed for the smaller telescope. Another issue with the smaller telescope is that it is much more sensitive to mirror slap and shutter motion. In order to get a sharp image, I used the mirror-up feature and waited 30 seconds to let the entire system stabilize. With the larger telescope this is still a problem, but attenuated due to the overall extra weight of the telescope relative to the Nikon D3s camera. The higher magnification of the larger telescope however, increases the effect of vibration. Focusing was done viewing the image through the camera using LiveView — and using a HoodMan to be able to view the LCD screen. After shooting images (and videos) for about 30 minutes, I did get a sensor over heating warning (which then turned LiveView off). Sun with Sunspots. Image taken with a Nikon D3s and Questar 3.5 inch telescope with solar filter (ISO 640, ~1500 mm, f/16, 1/250 sec). Raw image processed with Capture One Pro 6, Nik Define 2, and Photoshop CS5. Sun with Sunspots. 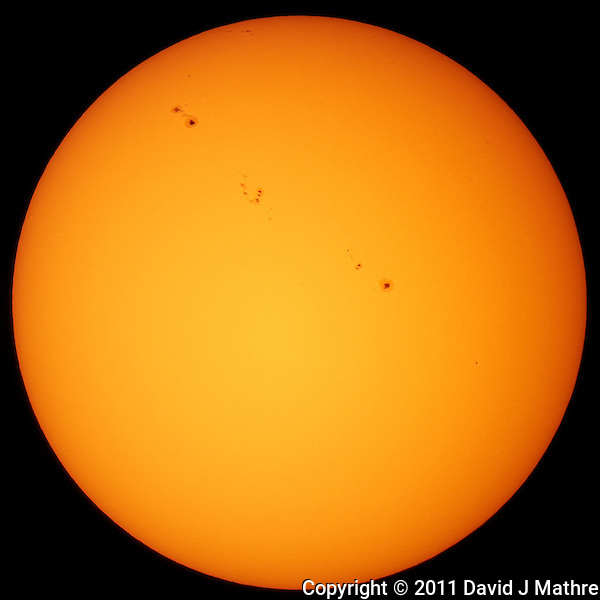 Image taken with a Nikon D3s and Questar 7 inch telescope with solar filter (ISO 200, ~2500 mm, f/16, 1/2000 sec). Raw image processed with Capture One Pro 6, Nik Define 2, and Photoshop CS5. Sun with Sunspots and Clouds Passing in Front. 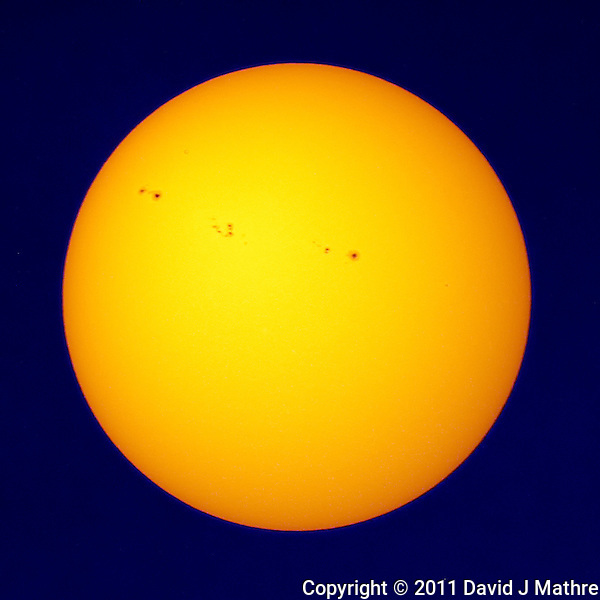 Image taken with a Nikon D3s and Questar 7 inch telescope with solar filter (ISO 200, ~2500 mm, f/16, 1/2000 sec). Raw image processed with Capture One Pro 6, Nik Define 2, and Photoshop CS5.